It wasn’t that long ago that there was very limited technology available for the deaf or hard of hearing. Deaf teens face typical challenges, such as coordinating socially with their friends, excelling academically, and taking part in extra curricular activities such as video games and sports. New advances in technology are making the lives of deaf teens much easier. Social media is at the forefront of teen communication. On social media, being deaf has very little disadvantage; in fact, most people look at their social media platforms with the sound turned off. Videos are almost always captioned today, sometimes even automatically by the platform. All of this creates an environment where deaf teens can communicate on an entirely level playing field with their peers. Through social media, you can remain in constant connection with friends, family members, classmates, and even teachers. Instant messaging is now more frequently used than either phone calls or text messages. Perhaps even more importantly, social media makes it easier for deaf teens to connect with each other, joining support groups and being able to communicate with those who understand their life and their disability. Deaf teens can join events with any group of teenagers, find the resources that they need, and simply vent and chat with other friends – whether they’re hard of hearing or not. Social media isn’t the only technology that is making life better for teens. Things like artificial intelligent captioning products can caption things like video and live streams on-the-fly, even when human captioning isn’t provided. As this artificial intelligence improves, the captions become more accurate; someday, they may be more accurate than live human captioning. Many technology companies are working harder to be ADA compliant, with many games adding “deaf modes” so that deaf players can use visual cues rather than audio cues. This even includes multi-player games which can be played with the hearing and non-hearing. And, of course, there are new augmented reality and virtual reality products which may eventually make it easier for the deaf to “see” things that they cannot hear, by interpreting audio signals into video signals. Great strides are being made in technology, and teens are going to get to benefit from these technologies and many more moving forward. And it isn’t just for academic or day-to-day living: it’s also for fun and recreation. We Created An Online World for Deaf Teens – Join Us! 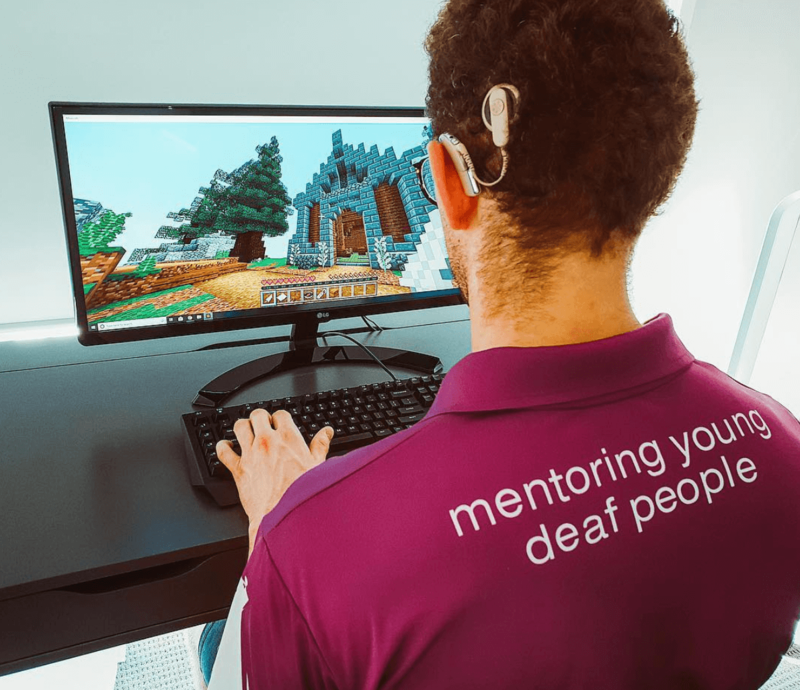 Our goal was to create a unique online community for deaf or hard of hearing teens, so some talented friends of ours helped designed our own private world – in Minecraft! Each week a group of teens meet in a private Minecraft server, called League of Hearoes, to build epic things and to go on adventures. If you’re looking to connect with other deaf or hard of hearing teens, come and join us. We play every Sunday at 7PM AEST. To join you need to go through a simple sign up process where we ask parents/guardians for permission for you to join. Once this has been done, you can become part of our online community which is growing by the day.